These cowboys are finishing up the last few techniques that are required at this event as they compete at the Calgary Stampede in the steer wrestling events. Steer wrestling is a timed event that brings out thousands of people each year to the Stampede. 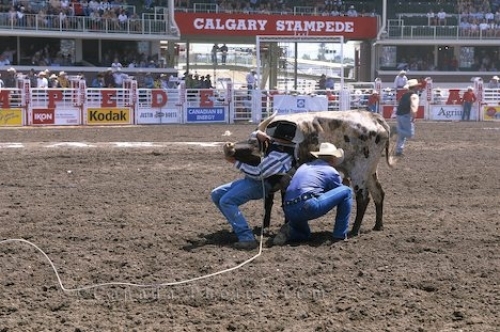 Picture of a couple of cowboys finishing wrestling with a steer at the Calgary Stampede in Alberta, Canada.